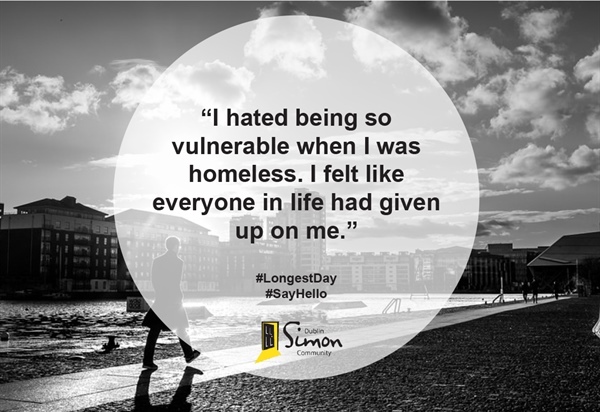 The Dublin Simon Community have today (21 June) kicked off their #LongestDay campaign. On the longest day of the year, we are calling on the public to send messages of support via Facebook @DublinSimonCommunity or Twitter @Dublin_Simon so we can share them with people accessing our services and going through the trauma of homelessness. “The longest day of the year is symbolic for this campaign. When you’re trapped in homelessness, with no place to call home or feel safe, you are forced to go without the simplest comforts and the days can seem so long. What was once straightforward becomes a daily battle – being able to cook a meal, wash your clothes or close your own door to the world at the end of each day. Whether you are a family trying to manage in a small hotel room or walking the streets of Dublin looking for somewhere to sleep at night, you have to go without the most basic things that we take for granted each day. The days can isolating, endless and relentless; everyday of the year can seem like The Longest Day. 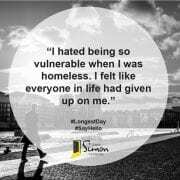 Throughout the longest day, Dublin Simon Community will share testimonials from our clients on Facebook and Twitter to illustrate the lonely and isolating nature of being homeless or at risk, and the daily struggles that people are facing. Each quote will be shared with the hashtag #longestday.